Ashley Alioto is a Brooklyn based visual artist. 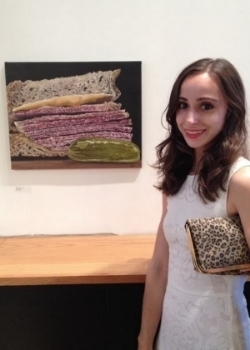 Born and raised in downtown Brooklyn, Ashley has always had a passion for culinary arts. She began her career working in pastry kitchens of fine dining restaurants throughout New York City. Interested in further developing her artistic skills, Ashley began creating sugar and chocolate sculptures. After joining a pottery and oil painting studio, Ashley was influenced by artist and studio director Joel Loeper to begin oil painting. Currently, Ashley is a member of Brooklyn Art Space in Gowanus, Brooklyn. Her artwork can be seen in various restaurants and cafe's in NYC. Ashley’s realistic oil paintings attempt to capture that moment when a person becomes fixated on a food and cannot help but "lick their lips"
"I have a fascination with the amount of power that an image of a single food item can hold over a person's emotions"